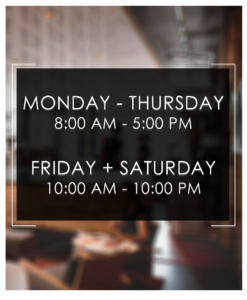 Indoor Displays are the perfect way to promote your business or organization. 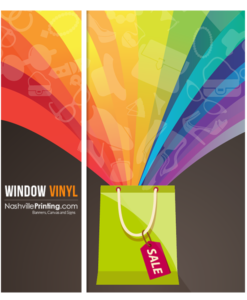 Great for trade shows, job fairs, seminars, and even office branding and signage. Durable and uniquely designed, this aluminum retractable stands are the perfect combination of versatility, appeal, and affordability. Retractables Include travel bag, Retractable base w/end caps, and Telescopic pole. 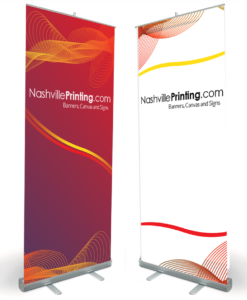 Custom printed 7 mil indoor premium vinyl banners and are an excellent compliment to these banner stands. These retractable stands are conveniently packed in a small bag and quickly set up in a few easy steps. 10oz Smooth Vinyl Indoor “X-Type” Banner Stands – Our Economy “X-Style” Collapsible Banner Stands are versatile and easy to setup. 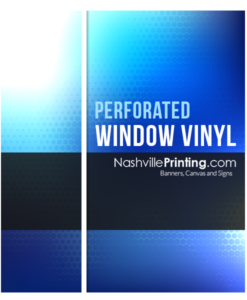 They come with a printed color graphic on 10 mil premium smooth vinyl and arrive in a slim nylon bag. 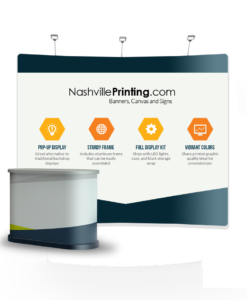 Trade show and event displays are made up of several mix and match items. Backdrops, lighting, table covers, pop-up’s, etc. can all be purchased individually to complete your perfect display. Seamless and wrinkle free displays offer easy set up, high resolution dye-sublimation printing, and are light weight. These beautiful backdrops make your display a breeze, especially because set-up can be completed in ten minutes or less. These versatile displays are ideal for presentations or advertisements to display products with clarity and ease. The frames are included and are aluminum that easily snaps together. The fabric is stretchy to make construction especially simple.